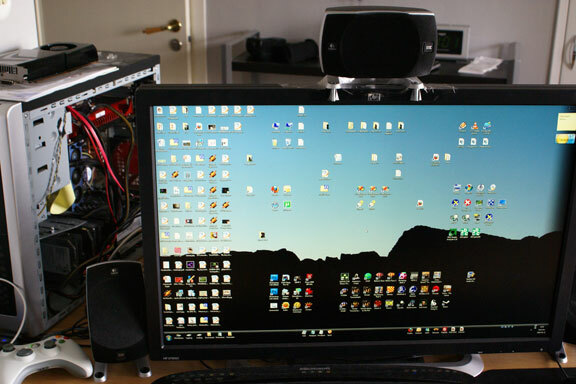 If you thought the Eyefinity feature of the soon to be released Radeon HD 5870 is for creating large resolution displays, well, I had another cool idea. Six outputs is as many as there are faces in a cube. Put six projectors in a cubic room with white walls and you can have a full surround display! Would need some coding support though, but could be potentially awesome. Certainly would be a great way to view my cubemap collection! The August 2009 release of the DirectX SDK is out. Funny name for a September release though. This release has the final DirectX 11 components. Speaking of DirectX 11, new details on the HD 5870 are trickling out to the public, and from the looks of it, it'll be a pretty nice card. Supposedly due for release in two weeks. It'll be interesting to see then if it's as awesome as it's painted out to be. 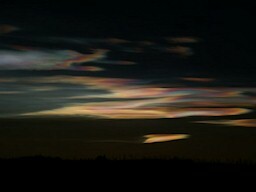 I've uploaded another gallery. It covers the winter 2008 to late spring 2009. If you're old enough to have played 8-bit games when they were new, you'll probably love this awesome video. Especially if you also played a lot with Lego. Today we'll be baking a working GPU. 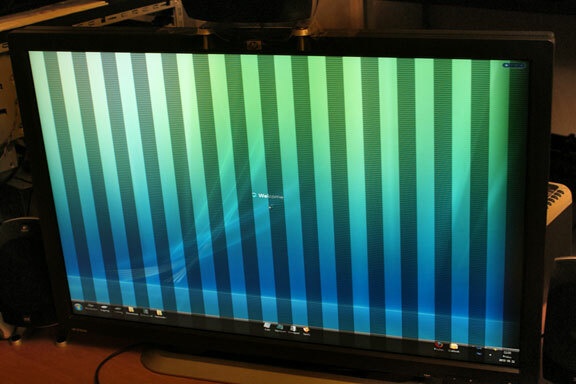 Verify the GPU is still broken. Remove heatsink and all detachable parts from GPU. Put the GPU on a few supporting screws in the middle of the oven and bake at 200-275C until lightly brown on various plastic parts. Let it cool gently in the oven. Reattach heatsink and other parts. Put into computer and boot it up. Verify that the card is now functional. Whooha, you actually did that? Yep. So what's the deal? 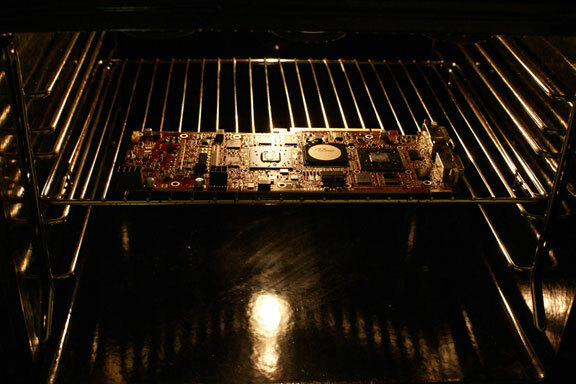 Well, I read a forum post where someone had resurrected a video card by putting it into the oven. Some people also claim to have resurrected their Xbox360 by putting it into a few towels and let it run for about 20 minutes. The reason why this sometimes works is that a leading reason for hardware failure is solder joints that crack over time. If you heat the device enough it will cause the solder joints to melt and reconnect. The melting point of commonly used solders are within reach for a regular household oven. Some of you may recall I had a broken 3870 X2. So I thought I should attempt this trick on it. 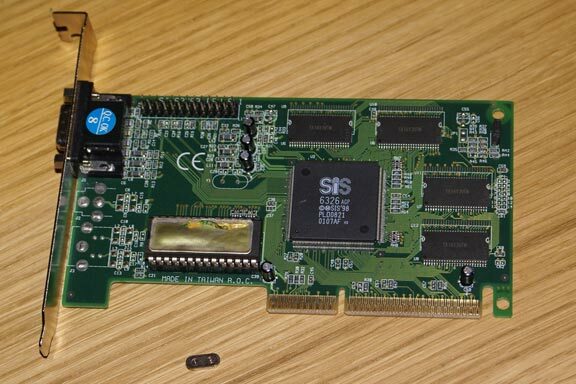 Just to give me a sense of how well this would work I first attempted this on an old SiS AGP card I found in my closet. I didn't even know I owned one, heh. So I put it into the oven and turned it to 200C. It didn't even reach that temperature before I heard something fall. Turned out some component fell off. Lesson learned was to not put the card upside down. Seems kinda obvious afterwards, but with melted solder it will of course fall off if it's hanging under the card with only the solder joint supporting it. Then I tried it on the 3870 X2. I had to heat it much further before the solders melted. I opened the oven and poked a solder joint now and then to see if it was still hard. I had to go all the way to 275C before it finally melted. I turned off the oven and let it cool gently in there for a couple of hours before taking it out. Then I looked very carefully at all the solder joints to verify that nothing had melted too much and made a short circuit. This is of course a very important step if you're attempting this trick. A short circuit could potentially damage your whole computer or cause a fire, so don't try this if you're unwilling to take any chances. Keep an eye on the card during the whole process and double check the results. If you see any signs of any solders having flowed away from its attachment point, you may consider not attempting to boot it up. Everything looked fine on my card though, but I did at least make a full backup of my important files to an external drive before putting it into the computer. Booting up the card it now appears to work. I've been gaming on it for a couple of hours with no problems so far. The Just Cause 2 website just got online. Check it out! Sad to see, but Swedish game developer GRIN has gone bankrupt and closed its doors. On a positive note, their thank you letter ends with a "brb". Having been on vacation I'm a bit late to the party, but OpenGL 3.2 has been released and the specs are available here. I like the progress OpenGL has made lately and it looks like the API is fully recovering from the years where it was falling behind. If Khronos can keep up this pace OpenGL will remain a relevant API. I hope the people behind GLEW and GLEE get up to speed though because neither have implemented OpenGL 3.1 yet. In the past I rolled my own extension loading code, but was hoping to not have to do that and use libraries like the above. Looks like I might have to do my own in the future as well just to be able to use the latest and greatest.